Let’s break down my official All-Star ballot — and then start debating. It’s NBA All-Star selection time and once again I’ve been asked to cast an official vote that will be reflected in the media portion of the formula used to select the starters from each conference. Like the fans and players, the media has been tasked with picking five players from each conference with two backcourt and three frontcourt slots. Having an indirect influence over league business is not a comfortable position to be in, but it’s a responsibility I take seriously. In addition to hours spent watching basketball every night, I’ve pored over stats and talked to trusted league sources when making my picks. Most of these picks were relatively easy. A few were painfully hard. I’d gladly trade one of the backcourt spots in the East for another frontcourt opening in the West, but that’s how it goes. As a reminder, the fan vote counts for 50 percent with the media and player vote accounting for 25 percent each of the final tally. Once the starters are chosen, the coaches will pick the reserves. Celtics’ biggest regular-season victory of the season, Kyrie dropped 27 points and 18 assists on the Raptors. To watch Kyrie operate is to witness a player existing in another realm. He is Dr. Strange, the NBA’s Sorcerer Supreme. KEMBA WALKER: I went back and forth on this one numerous times, but ultimately decided to roll with Kemba, who’s carried the Hornets all season. It seems like forever ago when some were trying elevate Walker in the Best Point Guard in the League discussion thanks to his torrid start. Kemba has cooled off some, but there’s no denying his impact. Note: You can make a case for Kyle Lowry, Ben Simmons, or Bradley Beal and you wouldn’t be wrong. It’s not that all these players aren’t deserving of All-Star recognition, it’s that none of them have truly stood out to make an unimpeachable decision. (Walker was named an All-Star starter, beating out Simmons and Dwyane Wade). GIANNIS ANTETOKOUNMPO: Giannis was my first-half MVP pick and I won’t belabor the obvious. At 26 points, 12 rebounds, and six assists a night on 58 percent shooting from the floor, the Freak has become a singular talent. Fun question for the second half of the season: assuming Giannis grabs one of the two All-NBA forward spots, who gets the other? Anthony Davis and Nikola Jokic) and probably top two when you consider defense (along with AD). There’s no debate about the best center in the East, however. The Sixers are weird, but Embiid remains their anchor on both ends of the floor. JAMES HARDEN: The defending Most Valuable Player has been even better this season; racking up an efficient 35.7 points to go with 8.5 assists and a Usage Rate over 40. 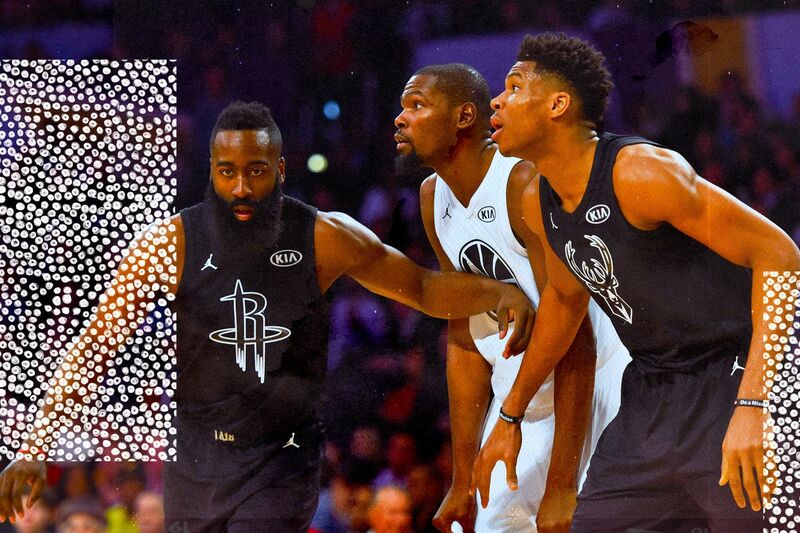 Harden’s blitzkrieg is the singular reason why the Rockets have been able to recover from the slow start and secure solid postseason positioning. He’s going to need some help if the Rockets are able to make another playoff run, but there’s no stopping him right now. STEPH CURRY: Is it possible for a two-time MVP with three championship rings to be underrated? Steph may never approach his twin MVP seasons again, but he’s still the league’s top shotmaker and most dangerous outside shooter. Put it another way: If you had your pick of any guard in the league, are you really passing on Curry? Note: Apologies to Damian Lillard, who has reached a level of consistent excellence that still gets taken for granted. Nikola Jokic or Paul George. Both the Joker and PG are deserving of All-Star starter status. I simply can’t get past NOT voting for LeBron, especially given his work in the 34 games he did play before the injury. (James was named an All-Star starter and a captain).